1. It is of an opaque red pigment of cinnabar or the Bimb" fruit. It is perfect. 2. It is perfectly round or oval. 3. It is very regular in shape. 4. It is without any hole. 1. There may be a black or white spot in the composition. 2. There may be a crack on the surface on in the body. 3. There may be more than one shades of color in the same piece. 4. There may be a depression, bend or twist on the surface. Red coral is the gemstone of Mars (Mangal). A person in whose birth chart Mars is lord of an auspicious house should wear coral. If Mars is lord of the inauspicious house in a birth chart, it will be harmful for the native to wear Red Coral. For the Aries (Mesha) Ascendant, Mars (Mangal) is lord of the Ascendant or Lagna. The person with this ascendant should wear a Coral all his life. Red Coral will give good health, longevity, courage, name, fame and happiness. It will neutralize the evil effects of Mars if it is ill disposed or is afflicted in any way. For the Taurus (Vrishab) Ascendant (lagna), Mars is the lord of 7th and 12th houses. In this case, native of this Ascendant should avoid wearing a Coral. However, if Mars is in his own sign in 7th or 12th house Coral may be worn, in the major period of Mars. For the Gemini (Mithuna) Ascendant (Lagna), Mars is the lord of the 6th and 11th houses. In this case, Mars will not be considered an auspicious planet. Therefore, natives of this ascendant are advised to avoid wearing the coral. However, Red Coral may be used if Mars is in his own sign or in the 6th or 11th in the Major period of Mars. For the Cancer (Karka) Ascendant (Lagna) Mars being lord of the 5th house which is a trine or Trikona and 10th house quadrant or Kendra is a very auspicious (yoga Karaka) planet. If natives of cancer Ascendant always wear it, they will be blessed with children, intelligence, good fortune, name, fame honors and success in their professional career. If Red Coral is worn with Pearl - the gemstone of the lord of Cancer ascendant results will prove more beneficial. The beneficial results will be more pronounced in the major period of Mars. For the Leo (Simha) Ascendant also Mars being lord of the 4th quadrant (Kendra) and 9th house - a trine or trikona is very favorable and auspicious planet (yoga Karaka) and wearing of Red Coral will give same beneficial results as in the case of Cancer Ascendant. Apart from these results the native will have or acquire lands and property and he or she will have good fortune, will become virtuous, his or her father will enjoy long life. If the Mars is posited in his own sign in the 4th or 9th the beneficial results will become more pronounced. Wearing of a Ruby - the gemstone of the lord of this Ascendant along with Red Coral will accelerate the beneficial results. For the Virgo (Kanya) Ascendant (lagna) Mars is lord of the 3rd and 8th house and is a malefic for this Ascendant. Wearing of Red Coral by the natives of this ascendant should be avoided as far as possible. However, if absolutely necessary, Red Coral may be used in the major period of Mars if Mars is in his own sign in the 3rd of the 8th house. For the Libra (Tula) Ascendant (Lagna) Mars is the lord of two Maraka (death inflicting houses) houses namely the 2nd and the 7th house. Moreover, Mars is an enemy of Venus, the lord of this Ascendant. Wearing a Red Coral by the natives of this ascendant should be generally avoided. The second house being the house of wealth, therefore, if Mars is in his own sign in the 2nd, Red Coral can be worn with good results during the Major period of Mars. As far as the 7th house is concerned if Mars is there in his sign, this disposition will give rise to a powerful Panchamahapurusha yoga known as Ruchaka yoga which will provide the native with a strong physique ruddy complexion, attractive body, charitable disposition, wealthy, long-lived and leader of an army". For the Scorpio (Vrischika) Ascendant (Lagna), Mars is lord of the Ascendant (and of the 6th). Nevertheless, his lordship of the Ascendant will prevail over the lordship of the sixth house. The Red Coral will be beneficial to the native in the same manner as for the Aries Ascendant. For the Sagittarius (Dhanu) Ascendant (Lagna), Mars is the lord of the 5th and 12th houses. The auspicious lordship of the 5th trine or Trikona will supercede or prevail over the lordship of the 8th hose and by wearing Red Coral, the natives of this ascendant will be blessed with children, good fortune, name and fame, particularly if Mars is in his own sign in the 5th house or bhava. For the Capricorn or Makara Ascendant, Mars is lord of the 4th and 11th houses. Wearing of Red Coral in the major period of Mars will provide native with land; property and conveyances. He or she will get domestic harmony, happiness from mother and gains of wealth. For Aquarius or Kumbha Ascendant, Mars will be the lord of the 3rd and 10th houses. 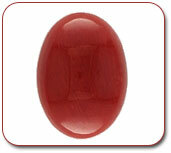 Wearing of Red Coral in the major period of Mars will be useful for promotion and success in the professional field. If, however, Mars is in his own sign in the 10th house, this disposition will give rise to Ruchaka yoga and the native can wear a Red Coral with advantage whenever necessary. For Pisces or Meena Ascendant Mars is lord of the 2nd house which is the house of wealth and 9th the house of fortune. Mars is, therefore, a very auspicious planet for this Ascendant and wearing of Coral will bring great success in the life of the native. Red Coral is necessary for them if Mars is ill disposed or in any way afflicted in their birth chart. Wearing of Red Coral with Yellow Sapphire will prove very beneficial.